Side 1 printed with four-color process, 1 PMS color using light coverage, 1 debossed area and 1 foil stamped area. Side 2 printed with 1 foil stamped area. 100lb Smooth White stock uncoated. H2 business card slits on the right pocket. 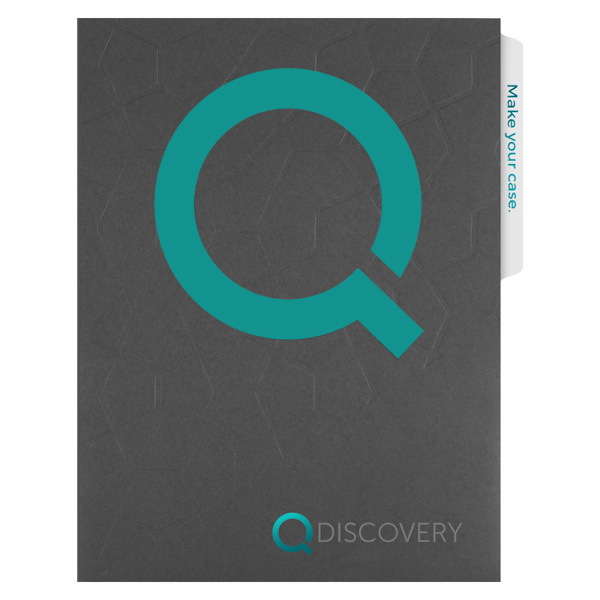 This file folder design combines metallic foil with a debossed cobblestone pattern, creating a unique, modern look. The teal color suggests professionalism and calm, collected feelings. The company's tagline appears on the folder's tab, while their URL and email address are on the back cover. Harvest Land Co-Op's repeated logo and neutral color scheme connect the audience to the brand, without bombarding their eyes with bright colors. A single colorful logo at the bottom features gold lines that look like rows of ripe crops and a large red number one to assert dominance within the industry. The file tab's shortened brand name makes the folder easy to find in a drawer or cabinet. 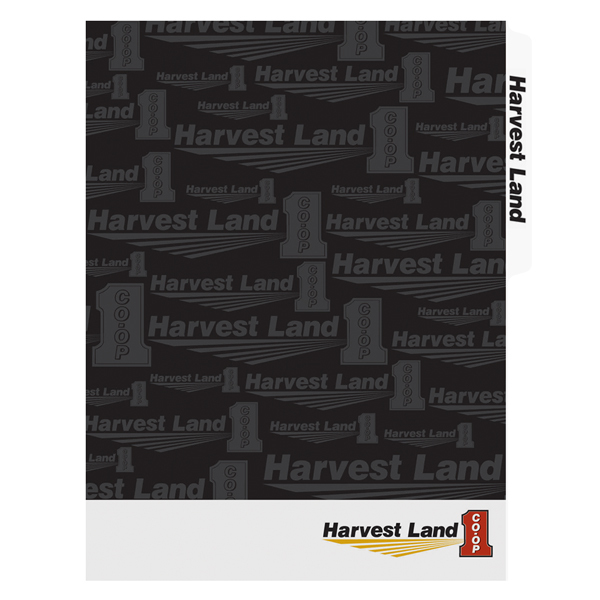 Rather than repeat the cover pattern on the back, the rear panel is solid black to make Harvest Land's contact information readable. Only one version of the logo appears on the back cover to tie that panel in with the rest of the design. Side 1 printed with four-color process. Side 2 printed with 1 PMS color using light coverage. 14pt C1S Semi-Gloss stock coated with Aqueous Matte. H4 business card slits on both pockets. Light effects give the cover a warm, youthful style. Its softness and sense of whimsy help clients relax while learning about their health policies and benefits. 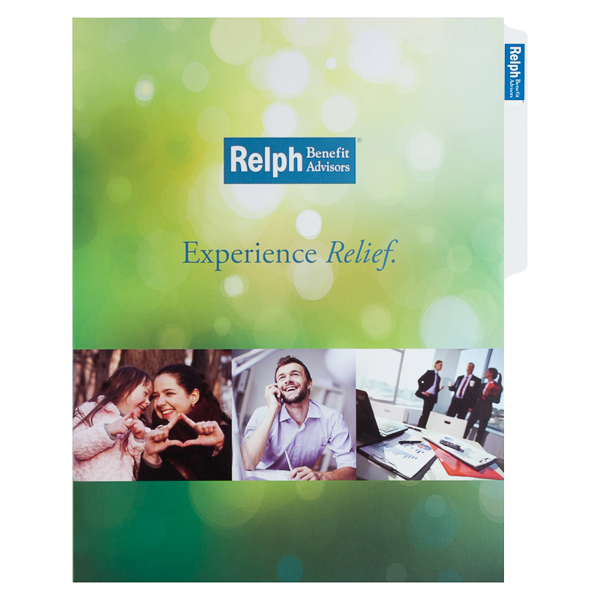 Six photos show who Relph Benefit Advisors helps. Pale blue pockets use a word collage to describe the brand and create visual interest. On the back, curved green lines lead from top to bottom, guiding clients' eyes from the logo to the pictures to the contact information. Side 1 printed with four-color process. Side 2 printed with 1 PMS color. 14pt C1S White Semi-Gloss stock coated with Aqueous Gloss. H1 business card slits on right pocket. 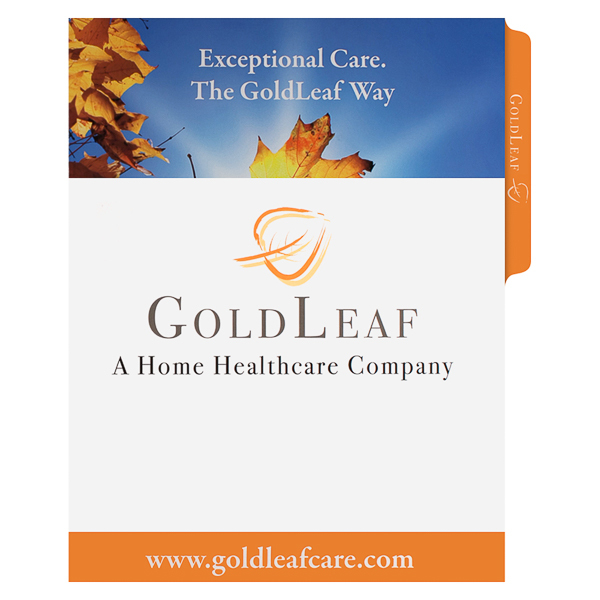 Orange accents resemble bright fall leaves and highlight GoldLeaf's URL and phone number. Large print contact info is visible to elderly clients, while the orange filing tab makes the folder easy to find in a drawer. A list of services on the back helps prospective patients learn how the home healthcare provider can assist them. With its two interior pockets and 1/2" filing tab, this product is ready to store and be stored. V-split left and right pockets keep 8 1/2" x 11" documents in place whether stored horizontally or vertically. The tab creates a customizable 3/8" x 4 1/4" space. Print it with bright colors, contact information, or a cool pattern to make your design easy to locate in a crowded filing cabinet. You can also leave the tab blank, so customers can write their own label. Dimension Closed: 9" (+ 1/2" tab) x 11 3/4"
Dimension Open: 18" (+ 1/2" tab) x 11 3/4"